At home, I generally cook vegetarian. Food, Inc. made me weary of buying generic superstore meat ever again, and I think I'm all the more healthier for it. So when I saw this recipe in Saveur, I knew I had to try it. 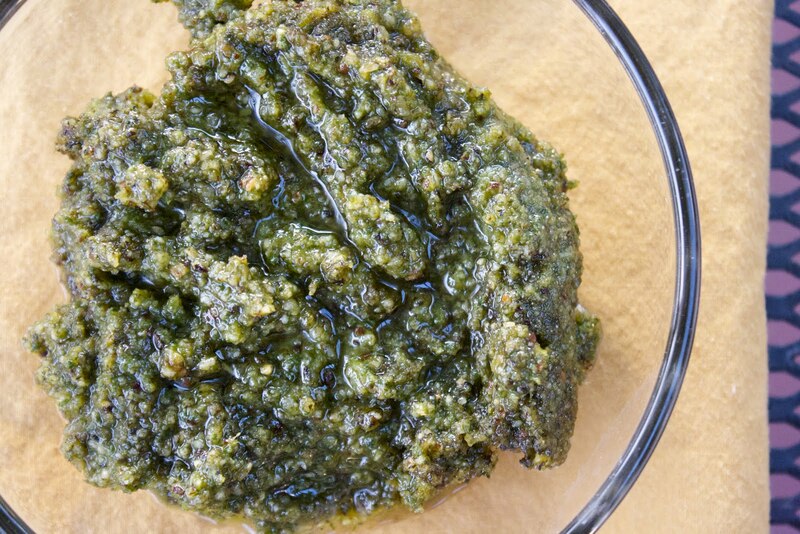 Oregano and hazelnuts are the stars of this creation, giving much more depth of flavor than your average basil pesto. The pesto can be spread on pasta, bread, and meats, but I recommend trying it on these easy to make sweet potato ravioli. 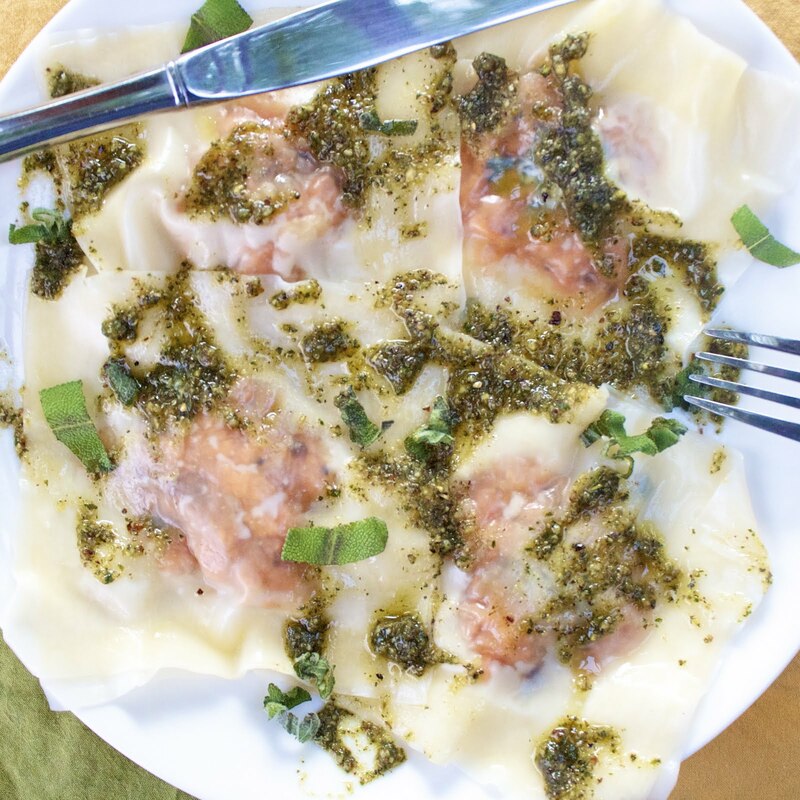 With simply wonton wrappers, egg wash, and filling of your choice, homemade ravioli can be made in minutes and only take two minutes in boiling water to cook. What looks like an impressive task is really just a shortcut. 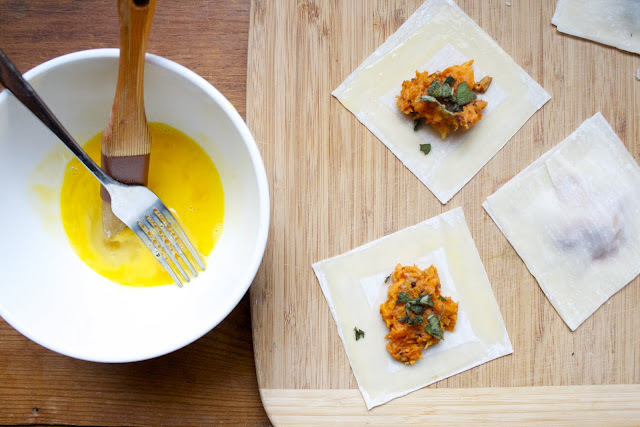 Thank you wonton wrappers (though I really do want to attempt making ravioli dough someday...). This is the lightest, while still being filling, pasta dish I have made to date, and is great for any time of year. I hope you enjoy it as much as I did. Bon appétit! First, make the pesto. 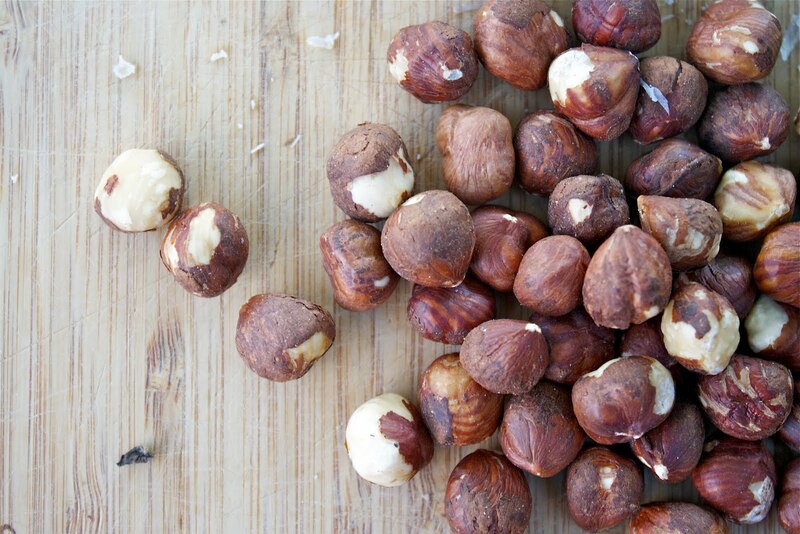 Process oregano, oil, basil, parmesan, hazelnuts, and garlic, in a food processor until finely ground. Season with salt and pepper, and set aside. Next, make the ravioli. Heat oven to 450 F. Cut sweet potatoes into thirds. Rub garlic and sweet potato with olive oil, and place, cut sides down, on a baking sheet, and bake until tender, about 25 minutes. Let cool briefly, and then remove potato skins and pass the potatoes and garlic through a potato ricer or food mill into a large bowl; mix in parmesan, browned butter, nutmeg, 2 tsp. finely chopped sage, oregano, and salt and pepper. Set filling aside. Place 1 wonton wrapper on a work surface and place 1 tbsp. filling in center; brush edge of wrapper with egg and top with another wrapper; seal edges. Repeat with remaining wrappers and filling. Bring a large pot of salted water to a boil over high heat. Working in batches, add ravioli, and cook until tender, about 2 minutes. Transfer to a large bowl and toss with pesto until evenly coated. 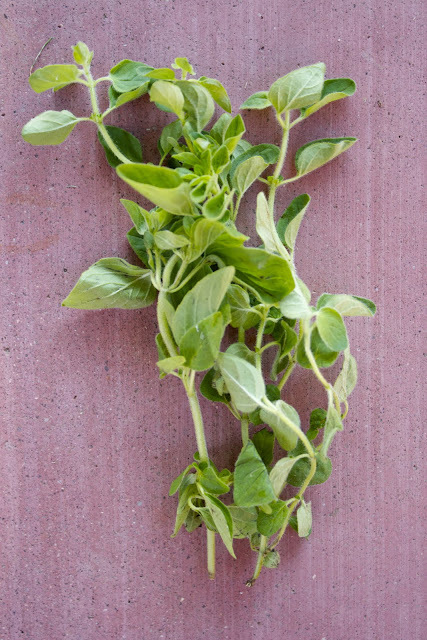 Arrange on a large serving platter or plates and top with sage leaves. Those look so delicious! And the filling is such a pretty color. 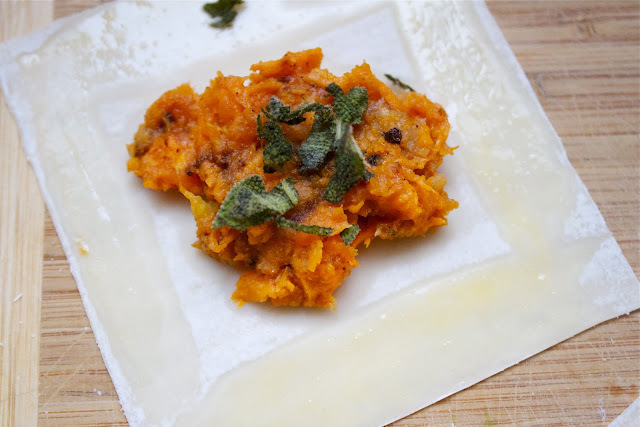 I've never had ravioli with sweet potato in it, I should give it a try. This ravioli has so many great flavors I can't stand it!! Love all the herbs, pesto and sweet potatoes. This sounds and looks heavenly. I know my husband and I would just love this. Bookmarking now! 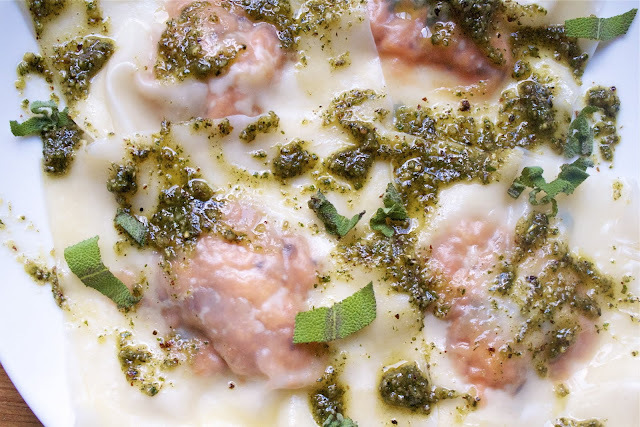 Today I've prepared these ravioli and we loved ! thank you very much for the recipe! I'm glad it turned out well, Sonia! Thank you!